Earlier this week it was announced that Pokémon GO had passed 500 million downloads. 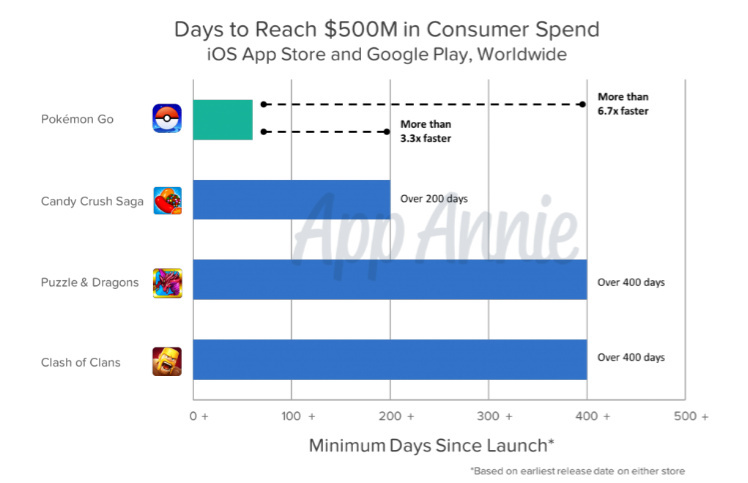 According to App Annie, that's also a significant number in terms of revenue from customers, with the analytics company declaring that GO is the fastest mobile game to make $500 million worldwide in customer spend. You don't need to be a genius to figure out that's an average of one dollar per player, though naturally the reality is that it'll be a group of dedicated players sinking a decent amount of money in the game. To give some context to how quickly this revenue's been accumulated, consider the graph below - hitting this figure in just over 60 days is miles ahead of equivalent figures for behemoths like Candy Crush Saga. It's a staggering rate or revenue, emphasizing the scale of the app's success. 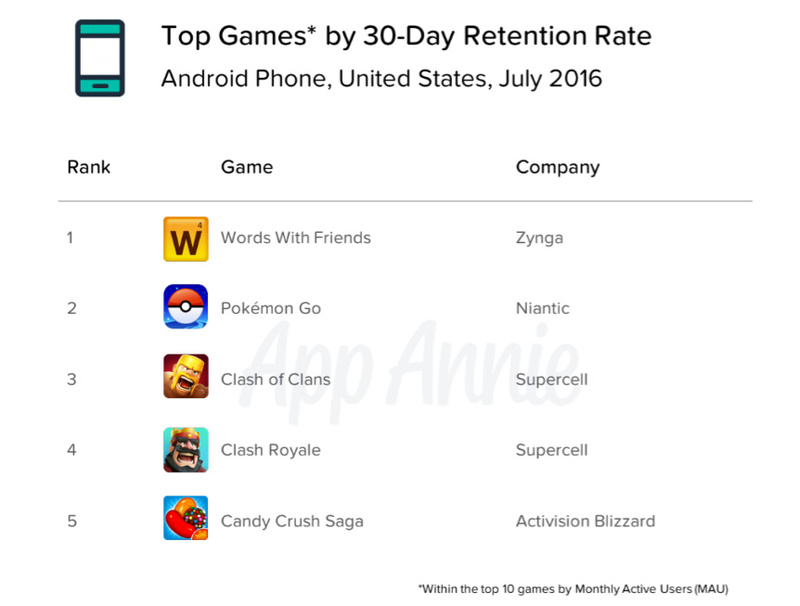 Importantly - from Niantic's point of view - the app is showing strong retention, only losing out to Words With Friends. It's a further reminder of the success of Pokémon GO; though it'll initially only be on iOS this December, Nintendo will be hoping that Super Mario Run will achieve similarly eye-watering results. 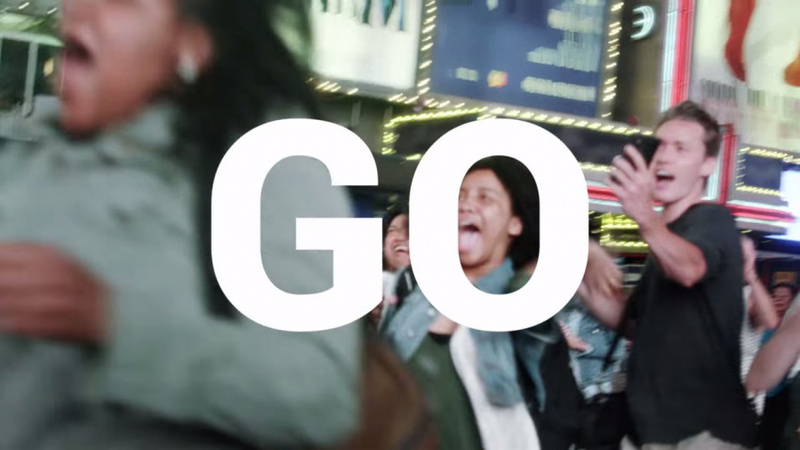 Frankly, however, the perfect storm that made Pokémon GO such a viral hit will be hard to recreate. So how much does Nintendo get? Tree Fiddy. I think Super Mario Run could be similar. Nostalgia and kids are too mean ingredients. "I really don't like this game ever since they removed tracking." "Cool. Now when's trading/PvP battling/Johto Pokémon coming?" As for my thoughts, this is great. It's impressive to just thing a game made half a billion dollars. Mind. Blown. @Acein210 1 down, 2 to go. It's why Nintendo games on mobile was such an obvious move. All those games in the chart have built up a brand name from nothing. It takes months to get the name known. Nintendo brands like Pokemon and Mario don't have that problem, which is the biggest obstacle in mobile success. @InternetBowser it's doubtful considering the monetization isn't the same, fronting a larger sum on mobile doesn't sit well with most which is why microtransaction games do so well. I do agree that Mario is a strong IP than Pokemon, but I still don't think it will do as well. I am surprised by the retention stat. I don't know how it is elsewhere, but where I'm at, seems like interest is waning. @LegendOfPokemon ...Close enough. 2 down, 1 to go. It isn't necessarily what Nintendo gets, it is what The Pokemon Company gets with their deal with Niantic (they wouldn't deal with Nintendo directly). From there Nintendo, being 1/3 owner (or whatever percentage it is) of TPC, gets to collect after everything is said and done. So it won't be anything extravagant like some people may seem to think. @RoomB31 You could be right, Pokemon Go was something special, but I think Mario could still do better than expected. It depends on the new adopters really. @Rogue76 I've noticed this too, but I wonder how much of this is retention and how much of it is just not-so-early adoption? It'd be cool if it had a stable pool of users but, like you said, anecdotally this seems to be not the case (although in my area I'd put at least some it down to school starting again). Why do people spend money buying intangible junk on free games? Lol that's always amused me! @World I live in a university town, so I really thought everything was going to be lured when school started again, it is actually more dead now than in the summer. Niantic founder and CEO will be ranked as one of the new top billionaires along with Mark Zuckerberg, Jeff Bezos and other tech company legends. Too bad most of that money is going to Niantic and not Nintendo. Hopefully Super Mario Run will have that same level of success. I'm one of those folks. I've spent a whopping $20 in incubators only. @MegaMari0 : I would be happy to buy unlimited use incubators if they gave us the option (and I'm cool with them being more expensive). I just can't justify spending $2 or so just to hatch 3 frickin' eggs. That's ridiculously overpriced. Plus, I don't want to support transactions for one-time use items. I was fine paying to increase my Pokémon and bag capacities as they are permanent and a way to "unlock" the "full version" of the game, but using real-life currency to purchase in-game one-time (or limited-use) items? Forget it. at this point, nintendo is really emphasizing brand visibility. they won't take wind away from the sails of mario run by anouncing nx until after run releases. as long as pokemon go is successful for them, if only by grabbing headlines, it fulfills the role of big nintendo neon sign. it's all in prep for the mass market release of the nx - which is still say will be at ces, after mario run's release and mission of attention grabber. Nintendo's in for a surprise if they're expecting anything nearly as successful as Go from Mario Run. I'm sure it'll be well designed, but runners are pretty common and there won't be much of a social element. People won't be meeting up to play Mario Run. Pokemon Go became big because of the media showing swarms of people zombie-walking around town with their phone. Mario Run is a regular smartphone game that won't get as much media attention, therefore no controvesy = less publicity. Also it's a single player game. In the end, it will still sells but less publicity. What Nintendo needs to do for another Pokemon Go craze is bringing Streetpass to the phone. It's this outdoor interactivity that encourages friends/family to download the app and the publicity through social medium. I expect nothing less from a game that makes worldwide news. That helps more than any brand power could. The Pokemon name just ensured that it would establish a base worldwide audience. Mario Run will do the same, but unless it manages to crash cars and get people robbed (which only the media likes), and also fight childhood obesity and promote social gatherings, it won't be nearly as successful. @Kiyata Why do people spend money on full games, or films, or TV shows, or books? I can foresee Nintendo going the way of Sega. Giving up on making consoles and using its IP's on mobile platforms and other devices. Especially so as NX to me looks like Nintendo is already taking steps towards crossing that bridge as this device appears to be mobile, excluding a SIM card slot to allow it to make phone calls. I believe if the NX flops then Nintendo will go down the line of IOS and Andriod. Hence they are dipping their toes in the water at this stage already, and they are reaping the benefits with share price increases and percentages of profits etc. I hope they don't abandon hardware production. Only time will tell. It's just a game where you catch Pokemon! The Pokestops are everywhere!I really don't understand how people can think of paying more than 500 million for an unfinished, buggy game. Maybe 400 million was made in the opening week, and then I could see why. It was a "masterpiece" at the time, when tracking worked. Sorry, I just had to rant a bit. Pokemon Go to me is an insult to gaming, but I'm not trying to put down anyone who likes the game. Have a nice day. @Dpullam Yeah, I really wish the money was at least a 50/50 split. It's a shame that Nintendo/The Pokemon Company couldn't get a better deal than what they ended up with. @Wandman5612 It's The POKEMON Company, so I think they should have gotten a better deal with POKEMON Go. It uses their creatures and a bit of the formula in the games. I expect Mario run to earn more than this. @Aerona Brand awareness will get an initial massive push- Pokemon Go without Pokemon is a half-baked, glitchy mess. So far, Pokemons in Pokemon GO still generation 1, right ? I hate running out of Pokeballs and have no Stops nearby. @Wandman5612 na they got a great deal. The problem is its split five ways. The rest are obvious haha. @faint I don't really know the PGO statistics, but it still seems bad how they split 5 ways. They should have given it only to TPC or Nintendo (although Nintendo technically owns TPC). @Wandman5612 well Niantic gets a cut for development, updating and maintaining it. 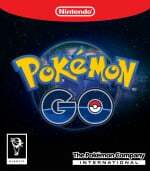 The rights to Pokemon is split between 3 owners being Nintendo, Pokemon company and Creatures ink/Game freak. That makes a four way split and then apple gets a cut so that's a five way split. @CrazedCavalier I hope you're right. I'm sure it'll be successful, just not that successful. @MarioPhD I guarantee you the community for Words with Friends is very robust. I left the game after the initial fervor. Came back and now have a dedicated group of friends, family and acquaintances that I play regularly, along with dozens of random people every week. @Mega_Yarn_Poochy You pretty much nailed that first prediction, and just in time, too. I would say, that it is quite upsetting seeing people wasting half a billion dollars on nothing, but we all know there are plenty of people out there, who have much more financial ressources than they could waste in a lifetime, so it really doesn't matter. Yeah, sure people are starving out there, and so this may seem weird to say the least, but it's pretty clear to me, that those ressources would never have reached those who needed it most anyways, so there is no real harm. What DOES bug me, is that it's also true that not anyone who wasted those half a billion dollars could in fact afford to do so. You may that people have to take responsibility for themselves and their action, which is certainly true, but it's also true that as with for example gambling, there are reason why there are laws clearly regulating and restricting these individual activities. The reason is that, like many other activities that stimulate particular parts of the human brain and psyche, they can turn into an addiction and thus a disease pretty quickly. At this point, choice and thus responsibility, start to matter less and less and and which point games, are just enablers for folks to hurt themselves against their better judgement and in most cases (hopefully) will. While Pokemon GO is certainly no worst-offender in the category of intentionally creating an addiction and thus making people actually sick, it's also not blameless. The question to me is how much merit there is in the not-the-worst-evil-out-there argument. On the other hand, yeah, they could have made the game ALOT more pay-2-win, and incentive people ALOT more aggressively to spend money, so maybe, by virtue of comparison, it's actually decent. I don't know frankly, but the whole concept of these games doesn't sit well with me, no matter of relatively "benign" the respective product ends up being. @SLIGEACH_EIRE what about the loch nes monster? @faint Hmm... Seems fair enough. At least TPC is getting credit, I'm happy.